On a recent trip to Denmark, a country with less than 6 million people, I saw firsthand the magnitude and power of a successful, working robotics cluster and how it can be an equalizer as well as an instigator. For example, Denmark is 7th in global robot density, i.e., the number of multipurpose industrial robots per 10,000 employees in the manufacturing sector (behind Korea, Singapore, Japan, Germany, Sweden and Taiwan) and Denmark doesn’t have an auto industry contributing to those figures. Clusters need successes so that there’s money to invest, mentors to provide coaching, and stories to be told. Finally, clusters need organization and help navigating technology transfer issues, local regulations, securing governmental incentives, startup help and scale-up assistance. Universities and government-sponsored funding agencies often offer these services as do accelerators and venture capital firms – but with varying levels of capability. Successful cluster organizations help cut through all the bureaucracies and expedite what needs to be done. Clusters can be planned. In China, the national government has outlined and funded a massive plan to make robotics a domestic industry instead of buying robots from offshore companies. They have mandated 20 regional universities and local governments to work together to develop the technologies, incubate and fund startups, provide them with office and factory space, funding incentives, and get them up and producing. Not all planned clusters achieve their goal. Each of the stakeholders has to play their part and serendipity also has a role in making a successful robotics cluster. Numerous cities and areas have tried and failed. Many are hopeful of success (and we are hopeful for them as well). Many are successful and productive such as RoboValley in The Netherlands, the Boston/Cambridge cluster, the cluster in Pittsburgh and the SF Bay Area/Silicon Valley cluster. It really needs active community spirit and some level of altruism. An example is the Silicon Valley cluster which struggles to get beyond an elitist flavor (which I perceive as selfishness). They have everything going for them: frequent get-togethers, lots of success stories, plentiful sources of money, multiple accelerators, really talented people including the scattering of the Willow Garage people, but they can’t shake the elitest label. Billionaire Scott Hassan founded Willow Garage with a public-spirited goal to develop a general-purpose personal robot to move around a house and help the daily life of people. Willow Garage was founded in 2006 (and closed in 2014) and operated something like Bell Labs and Xerox Parc did in, and for, the PC industry: it developed the open source robotics software system (ROS) and the TurtleBot and PR2. Willow Garage funded 60 research scientists each year in an ever-changing cadre that have since migrated to prominent robotics startups and businesses around the Bay Area (and world), all stimulated by an altruistic billionaire. “The Odense cluster began 25 years ago when Maersk was planning to build an advanced shipyard in Odense and robotic welding and the advanced software for operating self-programming robots were to play big roles. They sought help and made sizeable donations to South Denmark University (SDU). Many of the key people in today’s robot scene were educated during that period, (e.g., Claus Risager was a project engineer at the shipyard and now heads the Danish Technological Institute (DTI) with a robotics division in Odense. Enrico Iversen, Thomas Visti and Esben Østergaard, CEO, COO and CTO of Universal Robots (UR), all graduated from SDU). As the shipyard closed the robotics people moved around. The SDU assisted in the creation of UR. The MIR people [a recent mobile robotics startup in Odense with Thomas Visti as CEO] were involved in the early stage of UR. It is all a very well connected community. At the same time the Danish culture is very much a sharing one and much less competitive than the US system. As the shipyard closed down the Mayor and local politicians have been very supportive of the creation of new companies to support the local economy. Many people from that time have been key to the success. It is an ideal combination of technology, business development and entrepreneurs,” said Henrik Christensen, a Dane that was a founder of EURON and later headed the US group that produced the American Roadmap for US Robotics. Christensen is now the director of the Contextual Robotics Institute at UC San Diego. Clusters often ride on the coattails of successful companies. This is certainly the case with the Odense cluster. Universal Robots (UR) has become a country-wide hero in Denmark and particularly in Odense, where it is headquartered and where it employs 300+ people. Universal Robots recently sold to an American supplier of test equipment, Teradyne, for $315.4 million (according to Teradyne’s Edgar filing) making many of UR’s top people multi-millionaires. And those very same people are already reinvesting some of their money in new ventures in Odense. The Odense cluster is multi-layered. 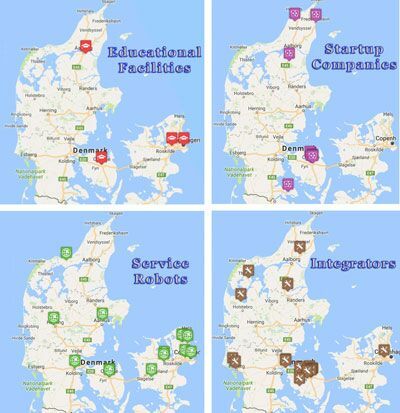 They cooperate with national government-sponsored organizations such as RoboCluster; they work hand-in-hand with the main local university (U of Southern Denmark) and hundreds of other robot companies, research organizations and national clusters and networks. The chart below – which you can enlarge by clicking on it – provides details of the 30+ higher education programs, 10+ knowledge and research institutes, 80+ robot and automation companies and 10+ clusters and networks, plus the 2,200+ robotics-related jobs in the Odense area. 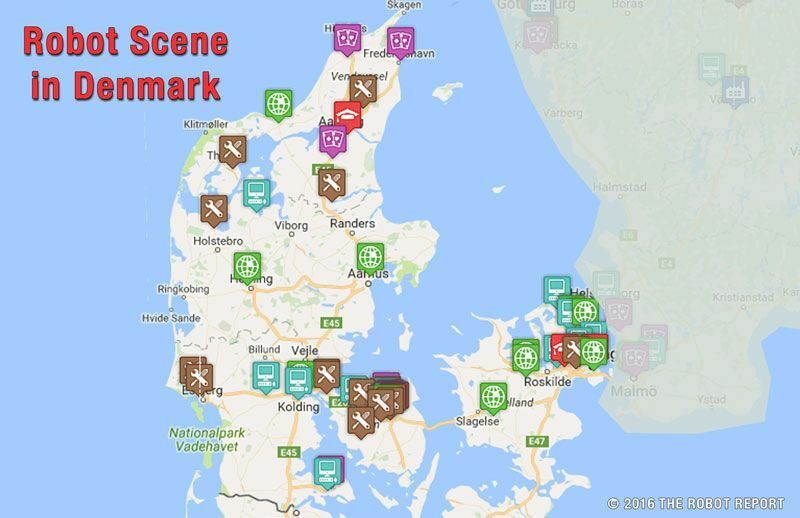 On my visit I asked each person I met whether they had personally received any support from the Danish or Odense cluster and each offered a story or two that showed they had a favorable impression of those interactions, particularly with the Odense apparatus. One person said he was able, through the mayor’s office, to expedite a zoning approval; another was able to work with the university (University of Southern Denmark) regarding research and finding talent; another said he got help finding local vendors capable of sub-contracting their needs; and many told me about encouraging foreign visits and assisting with foreign visitors. Others taught classes at SDU and hosted open houses at their robotics-related companies. They all told me about timely investments made by the Danish Growth Fund and other state-sponsored funding entities. I’d say that since everybody I talked with could cite an example of how they were helped by and spoke favorably toward the cluster, that the cluster was operating successfully.